Receding hairline is a male hair loss problem since it affects more men than women. It can be very bothersome and ruin your hairstyle. But the worst thing, it may make you to become bald. In fact most cases of baldness in men start with receding hairline. But does it always lead to baldness? 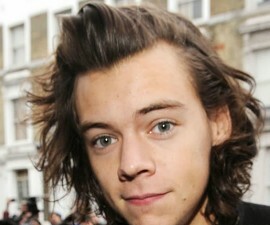 It’s thought that receding hairline is a hereditary condition, though not all cases are genetic condition. It tends to run in families. So if you have a father or brother with it, you have greater risk to have it, too – but this doesn’t mean you definitely will have it. The cause of receding hairline is unclearly yet. But mostly, it is associated with the excess amount of male hormone, testosterone. Testosterone is the fuel for the production of androgen dihydrotestosterone (DHT) that can cause damage to hair follicles in the scalp. Interestingly, not all men with high testosterone experience baldness. This suggests that there may be another factor to trigger the problem. 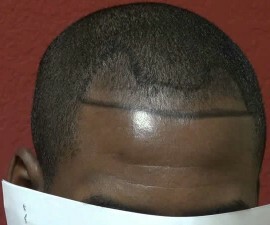 The good news, receding hairline is usually not serious (harmless). Although in many cases it can be an early symptom of male-pattern baldness (MPB), but it doesn’t always end with baldness. So like other hair loss problems, the prognosis can vary from man to man. Furthermore, there are now plenty of treatment options for coping with the problem. The use propecia (finasteride) is commonly suggested. It can address the common underlying condition of the problem since it works by suppressing the production of DHT. 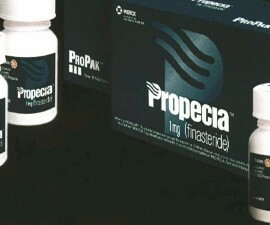 See more about propecia in here! 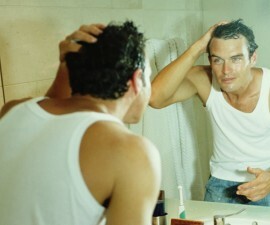 As the name suggests, receding hairline is a condition of when your front hairline (typically on both sides) recedes. The prognosis of the problem can vary. While some may find that the problem doesn’t get worse, others find it does worse and even may lead to baldness. Depending on the cause, it usually starts to occur at the ages of 20s or 30s. But there are also some that notice earlier such as before the age of 20 (see also receding hairline at the age 17)! And in general, the earlier age you have it means the greater chance you have to end it with baldness – particularly true if it is genetic condition (you have a family history of baldness). If it is a sign of MPB, you will develop “M” hair shape pattern, which then U-shape, and eventually may end with baldness (see the picture below)! Although many cases of the problem is an early sign of MPB, but this is not the single issue. Sometimes it may occur due to other conditions. Sometimes taking some cancer treatments (such as chemotherapy) can lead to receding hairline, too (see more in here). Certain lifestyle or environmental factors may also have contribution such as high stress, poor diet, or exposed to certain chemicals. Overall, again it is harmless and doesn’t pose to any health risk. Men who are looking for the treatment are usually only for a cosmetic reason. But if you do concern about your receding hairline, there are some treatments to choose from, as noted before – read the complete guide of treatment options for this hair loss problem in this post! Does Propecia Stop Receding Hairline?